New from Royal Langnickel, these Classroom Value Packs suit every project, age group, class size, and budget. Each set is filled with an assortment of Royal’s most popular classroom brushes, contained in a versatile storage tray that doubles as a drying rack. Ceramic Glaze Brushes, Set of 16 — For all glazes. The set includes 4 of each size, 16 pieces total: 3 Round, 4 Fan, 6 Flat, and 3/4 Glaze; plus a bonus brush-drying and storage rack. Bristle Large Area Brushes, Set of 12 — For oil and acrylic. The set includes 4 of each size, 12 pieces total: sizes 1, 2, and 3 Large Area brushes, plus a bonus brush-drying and storage rack. 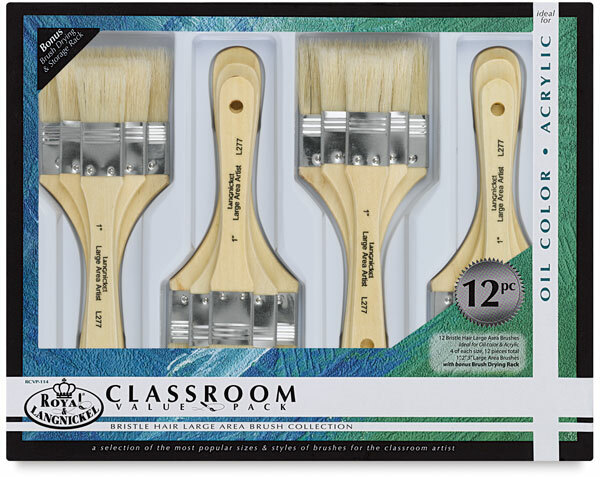 Natural Large Area Brushes, Set of 12 — For oil and acrylic. The set includes 4 of each size, 12 pieces total: sizes 1, 2, and 3 Large Area brushes, plus a bonus brush-drying and storage rack. Long-Handled Bristle Rounds and Flats, Set of 24 — For oil and acrylic. The set includes 4 of each size, 24 pieces total: sizes 2, 6, and 10 Round; sizes 2, 6, and 10 Flat; plus a bonus brush-drying and storage rack. Plastic Palette Knives, Set of 36 — For oil and acrylic. The set includes 6 of each style, 36 pieces total, plus a bonus drying and storage rack. Natural Rounds, Set of 144 — For oil, acrylic, tempera, and watercolor. The set includes 48 of each size, 144 pieces total: sizes 1, 3, and 5 Round, plus a bonus brush-drying and storage rack. Chubby Brushes, Set of 24 — For tempera, watercolor, and acrylic. The set includes 4 brushes in each of 6 colors, 24 pieces total: Round and Flat, plus a bonus brush-drying and storage rack. Golden Taklon Large Area Brushes, Set of 12 — For tempera, watercolor, and acrylic. The set includes 4 of each size, 12 pieces total: sizes 1, 2, and 3 Large Area brushes, plus a bonus brush-drying and storage rack. Golden Taklon Rounds and Flats, Set of 30 — For tempera, watercolor, and acrylic. The set includes 5 of each size, 30 pieces total: sizes 3, 6, and 10 Round; sizes 4, 8, and 12 Flat; plus a bonus brush-drying and storage rack. Natural Rounds and Flats, Set of 30 — For watercolor and tempera. The set includes 5 of each size, 30 pieces total: sizes 3, 6, and 10 Round; sizes 4, 8, and 12 Flat; plus a bonus brush-drying and storage rack. Camel Rounds, Set of 24 — For watercolor and tempera. The set includes 6 of each size, 24 pieces total: sizes 3, 5, 8, and 12 Round; plus a bonus brush-drying and storage rack.